Builds bone matrix. 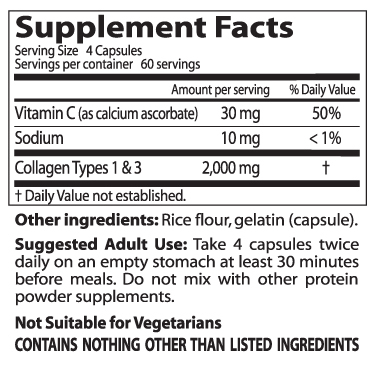 Collagen is the mechanical strength of bone. Help improve circulation; and promotes wound healing and a clearer complexion. Does Not Contain: milk, egg, wheat, gluten, corn, soy, sugar, sweeteners, starch, or preservatives. Type I collagen is also the major protein found in skin connective tissue where it is responsible for providing skin with its tensile strength and resiliency.3 Type III collagen is found at high levels in cardiovascular tissue and also in newly developing skin. It is essential for the proper development of the cardiovascular system and skin tissue. Types I and III collagen are often found together in the same tissues, as each form complements the structural integrity of the other. Vitamin C is required for the synthesis of collagen and participates at nearly every step of the process. The critical role of vitamin C involves preventing the inactivation of several key enzymes required for collagen biosynthesis. Studies suggest that vitamin C enhances the function of fibroblasts and promotes an increased level of collagen deposition by these cells in human tissue.4 Vitamin C also functions to promote the strengthening of the collagen matrix and supports an increased level of collagen density in organs and tissues. These effects of vitamin C also suggest that intake levels of this vitamin may be inadequate as we age. As oxidative stress in tissues increases with age, there is an increased requirement for this crucial antioxidant vitamin to promote optimal collagen production. 1. Jensen LT, Høst NB. Cardiovasc Res. 1997 Mar;33(3):535-9. 2. Vashishth D. Curr Osteoporos Rep. 2007 Jun;5(2):62-6. 3. Callaghan TM, Wilhelm KP. Int J Cosmet Sci. 2008 Oct;30(5):313-22. Sci U S A. 1981 May;78(5):2879-82.